My first map. Its small (22 areas), but can take some rounds. Review by Brotherdan on 2/23/2016. 1. borders are messy: i.e. 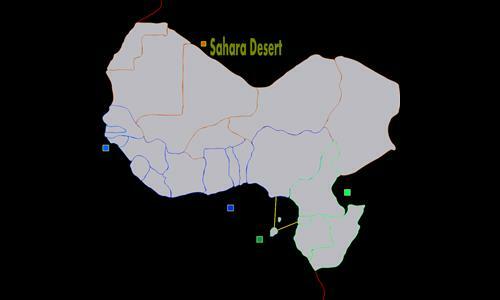 if you zoom in between Niger and Nigeria the ocra abd blue border hardly run parallel, often overlap, cross, etc. All the borders are similar: not too good looking. 2. Any particular reason to choose sometimes the french spelling and name (i.e "Guinee") and sometimes the english one (i.e. "The Gambia")? I don't have any favourite but be coherent in your choice. 4. somehow unbalanced bonuses. I understand you used territories-1, but you will never convince me to attempt to get the strategic nightmare of gulf of guinea: 7 territories ALL on the border, of which 4 menaced by 1 single territory and 3 by another... I'd sure go for congo area and Sao Tome. Suggestion: split the large bonuses in smaller ones, and keep up the good work! Review by General Amoora on 2/24/2016. I would say that this map has a lot of potential to be very good gamewise...but certain issues like inconsistencies in naming territories drags the map down a bit such as Thacd which should either be Tchad or Chad. Also, the map could be aesthetically improved, try looking for guides on how to make clean borders which are readily available on the Warlight Wiki or the forums. Otherwise, the idea is original and with small changes to territory names and borders, could become quite popular. Review by Daryle on 3/2/2016.